Alteration in total renal blood flow and its intra-renal distribution following acute or chronic ureteric obstruction was studied in dogs. The blood pressure, heart rate, ureteric pressure and renal blood flow of anaesthetised animals were recorded on a Grass polygraph using suitable catheters, transducers and preamplifiers. Regional renal blood flow was measured with the help of radioactive microspheres. The ureteric pressure started rising after its ligation and reached the peak at 24 hours and then declined steadily till 7 days. The total renal blood flow reached the peak at 90 mins followed by progressive decrease till 7 days following ligation. Total or regional blood flow did not change significantly in unobstructed kidney. In the obstructed kidney, a significant increase in blood flow occurred in zone IV (innermost cortex and juxtamedullary region) and a significant decrease occurred in zones I, II and III. Zone V showed no change. Heart rate and blood pressure were not significantly altered throughout the experiment. Research is sine qua non for progress and development of urology, as in any other clinical discipline. Basic features of a scientific research process are outlined and its maturation, down the ages, is tracted. 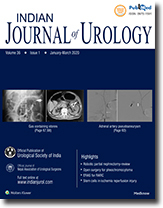 An overview of historical evolution of various facets of urology is provided and general trends of urological research are brought out, in retrospect and prospect. Such a review increases overall awareness and helps in generating a proper perspective and necessary stimulus towards creativity, particularly in the case of a trainee urologist. Finally, particularly in the case of a trainee urologist. Finally, some suggestions are offered for planning of research in Indian urology not only in terms of 'biomedical research' to improve urologic management, but also for "urologic health services' research", to effect delivery of urological care to all people. The problem-solving skills of a doctor in an encounter with a patient are central components of a doctor's professional activity and a natural focus for evaluation in undergraduate and postgraduate medical education. Most evaluation methods, like the traditional long case short case, and viva voce parts of the clinical examination are usually subjective, and the markings made by an examiner are not reproducible. There is also considerable variation amongst the examiners in at least some instances. The need for an objective, reliable, task oriented and reproducible system for evaluation of clinical competence is stressed. The Objective Structured Clinical Examination (OSCE) as applicable to Urology, and providing as a workable alternative with use of aggregate scoring is discussed with examples. Serum prolactin exhibits a circadian rhythm with a stable acrophase located at 0444 hr. The nadir is reached within 1-3 hours of awakening. Circadian biology of serum prolactin was investigated in 11 male adult patients in the age group of 20-30 years who were awaiting major urological surgery. Blood samples were taken at 4 hourly intervals beginning from 0000 hour. Prolactin was estimated by specific double antibody homologous radioimmunoassay. The data were analysed by cosinor rhythmometry. The acrophase was located at 0134 hour and the nadir of serum prolactin was located around 1330 hour in this group of patients who were waiting to undergo a surgical procedure. Such alteration in circadian biology could affect the periodicity of other physiological systems e.g. immunological status, susceptibility to surgical infection etc. It may be desirable to achieve euchronism by altering exogenous environmental pace makers (Zeitgebers) in the hospital wards which include noise level, light etc., and by ensuring prehospital home schedule with respect to meal patterns, social cues, slee-wake cycle, etc. during pre-operative period. The distribution of the mast cells was studied in 34 tumors of kidney and 28 tumors of urinary bladder of various types along with 15 normal organs of each for comparison, to find out the mast cell reaction in these neoplasms. All the tumors of kidney recorded an increase, while all the tumors of urinary bladder recorded a decrease in the mast cell population as compared to normal. The tumor parenchyma of all the malignant tumors in the present study did not appear to contain any mast cells. Mast cells were observed only in the connective tissue present in and around the tumor mass (es) and their population appeared to be dependent on the quantity and functional status of the connective tissue present in and around the tumor, which in turn apperaed to be influenced by the type, duration, stage, growth rate and vascularity of the individual tumors coupled with generalized immune reactions and possible local secretions by the tumor itself. At least 90 percent of all ureteral calculi, which until recently required open ureterolithotomy, can today be managed successfully with endoscopic techniques. About 30 percent have to be disintegrated within the ureter. This is best achieved by ultrasonic disintergration. In 120 reno-ureteral units stones were removed by this technique with no mortality, a low morbidity and a success rate of over 90 percent. Third-generation ureteroscopes have significantly improved the success rate and reduced the operating time. Ultrasonic disintegration within the ureter can be considered as a safe and sufficient procedure. Pre-operative or palliative embolisation of renal tumours is an established procedure. A variety of embolic agents including gelfoam, ivalon, steel coils and silastic spheres have been used. However all particulate emboli have inherent disadvantages such as recanalisation and formation of collateral tumour vessels (these emboli only block the small and medium sized arteries, causing only partial tumour infarction and leaving viable areas of the capillary bed). There is also the danger of reflux embolisation of other organs. In comparison, absolute ethanol offers important advantages; these are (1)being a fluid it diffuses into the entire capillary bed and produces instantaneous complete, permanent tumour infarction, minimising the possibility of tumour revascularisation, (2) even if accidental reflux occurs, it is immediately diluted by the large aortic blood flow and hence the safety of the procedures is enhanced, (3) ease of administration, (4) easy availability, (5) economical. We report our preliminary experience with this technique in five cases. Our experience in conservative management of bladder rupture, in eight patients of varied etiology, is presented. Criteria of patient selection for this mode of management are highlighted. Seven out of eight patients were cured completely. Cause of death in one patient was not related to bladder injury or it's complication. A high success rate encourages us to rethink about this optimum type of approach, to be adopted under difficult situations.